England 1392. As the Black Death quickly spreads through the kingdom, the little hamlet of Blythe’s Hallow suffers under the yoke of a sadistic Lord. Desperate, the villagers decide to seek out the magical help of a local witch, causing the wrath of the Church. Torture and murder befall on those accused of being in league with the Devil, adding more sorrow to the beset folk of Blythe’s Hollow. Yet, one man will rise against the tyranny; a man willing to learn Black Magick to fight back. 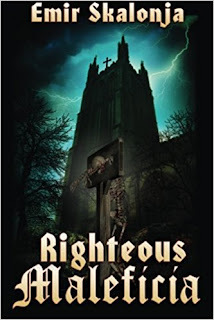 The term 'page-turner' has never been as apt than for Emir Skalonja's historical horror novel 'Righteous Maleficia'. Right from the beginning of the book you are brought into the plague infested world of Blythe's Hollow, a small village in which our main character Edgar goes about his duties in fear and under the watchful eyes of the church. His fellow villagers are also in fear because of what the lord of the manor (Lord Kenway) instructs the monks at the local church to do to people that don't follow the way. They have been led to believe that they should be afraid of the Devil or the witch that apparently lives within the woods but these villagers are afraid of what happens behind those cold stone walls of the church. Surely someone will not stand for what has become of Blythe's Hollow? Who will stand up and rise from the darkness to fight off those who are apparently plowing the way for good but are no better then the evil they despise? You don't need to be big on history to know that torture was common practice in the middle ages, with that in mind Emir Skalonja graphically details how a supposed traitor of the church would be punished. Written with a film makers eye this is one book that you get clear visions of what is happening in your mind, some of the images your mind may conjure up from reading may even haunt yourself. Definitely not for the squeamish.